Below are brief descriptions of Paul’s past and present research streams, covered in chronological order since they are connected over time. Nearly all relate to an overarching interest in how uncertainty (as opposed to risk) is managed in people’s minds as well as in organizations, markets and society at large. 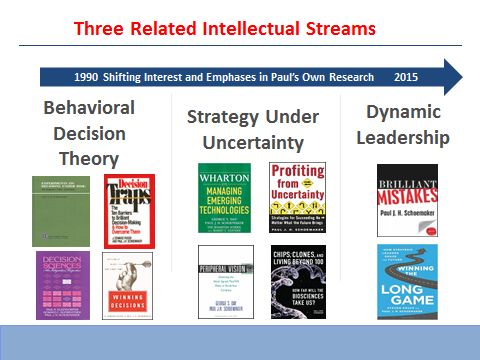 A long standing research interest is managerial decision making, building on Paul’s 2001 book with Jay Russo titled “Winning Decisions: Getting It Right the First Time”. This work extends an earlier book with Russo titled “Decision Traps” (Simon and Schuster, 1990) by examining how managers can improve their problem framing, intelligence gathering and choice procedures, as well techniques to improve learning from experience. The role of intuition and emotion are new topics of interest in this vast research domain of academic and applied research. A second major area of research is how managers and firms deal with emerging technologies. Much of this research was conducted through Wharton’s Mack Center for Technological Innovation, where Paul served as Research Director for 12 years. The program’s first research phase was summarized in the book, “Wharton On Managing Emerging Technologies” (Wiley & Sons, April 2000), which Paul edited with Professor George Day. The Center’s next research phase focused on how best to manage specific technology platforms, specifically innovations stemming from the confluence of life sciences and information technologies. This effort was published as a 130 page research report titled “The Future of the Biosciences” edited by Paul and Michael S. Tomczyk. Paul elaborated these inquiries later in Chips, Clones and Living Beyond 100 (Pearson Education, 2010), a book he published with Joyce Schoemaker (a micro-biologist as well as his wife). A third area of research concerns Paul’s book “Profiting From Uncertainty: Strategies for Succeeding No matter What the Future Brings” (Random House, July 2002). This research vein explores the challenges of approaching the future comprehensively rather than piece meal, the value of flexible strategies and options thinking, as well as the importance of dynamic monitoring and real-time adjustment. The focus here is on the challenges managers encounter when dealing with high uncertainty, tools and techniques they can use to navigate the unknown, and organizational mechanisms firms can employ to improve their agility and responsiveness. Paul has recently written papers with George Day on adaptive organizations and with David Teece about dynamic capabilities, both aimed at making organization more responsive to organizational change. A fourth area of research concerns the evolution of North American credit unions amid profound changes in financial services. Traditionally, the credit union sector was populated by many small players operating cooperatively with a strong focus on member service. The changing nature of this industry, as it competed more with diverse financial service providers, was researched by Paul and colleagues thanks to funding of the Credit Union Executives Society. This resulted in multiple reports such as “2010 Scenarios for Credit Unions” (2004), “The Chameleon Scenario Revisited” (April 2000) and “Key Success Factors for Credit Unions” (Feb. 2002); see Future Scopes series at www.cues.org. The strategic, managerial, organizational and cultural issues facing credit unions present a microcosm of the challenges many organizations. Being an under-researched and small sector of the financial services industry, credit unions illustrate shifting balances between cooperation and competition in industries. In a 2013 California Management Review article with Tom Donaldson, Paul argued that many industries have shot themselves in the foot due to insufficient industry-level cooperation with leaders mostly focusing on their own firms. This risk is especially acute when dealing with systemic risks as clearly witnessed in banking, pharma, oil/gas exploration, accounting and chemicals each of which caused enormous collateral damage. Credit Unions did relatively better as Paul explains in a chapter in the edited book The Future of Risk Management, University of Pennsylvania Press, 2018 (see article section). A fifth area of research explores how organizations can develop better peripheral vision and scanning capabilities, in part to anticipate risks and opportunities better. Building on a conference organized by Professors Day and Schoemaker at the Wharton School’s Mack Center for Technological Innovation, this research examines how managers can better recognize and act upon weak signals from the periphery before it is too late. Day and Schoemaker edited a special issue on this topic for “Long Range Planning“, co-authored a “Harvard Business Review” article on Scanning the Periphery (Nov. 2005) and published a book titled “Peripheral Vision” (Harvard Business School Press, 2006). Day and Schoemaker are currently examining the special role of agility and leadership in developing vigilant organizations, including role of real-time monitoring so that firms will position themselves better for change. They wrote a paper for the California Management Review (2017) that specifically addresses how firms can better deal with fast changing markets and technologies. With MIT Press, they will publish a book in 2019 titled See Sooner-Act Faster, based on data they collected in the private sector globally as well as from non-profit organizations in the USA. Another research interest of Paul’s concern is innovation, specifically how organizations can develop greater tolerance for failures of the right kind. Together with Robert Gunther, Paul published a Harvard Business Review article in 2007 on the “Wisdom of Deliberate Mistakes.” A deliberate approach to making mistakes may seem crazy at first but smart people do it all the time to accelerate learning and achieve higher performance. Pauls’ 2011 book Brilliant Mistakes: Finding Success on the Far Side of Failure developed this counter-intuitive thesis further. Shortly after this book was published, the publisher (Wharton Digital Press) organized an open competition where anyone could describe their most brilliant mistake. The results were summarized in the Wall Street Journal (http://wdp.wharton.upenn.edu/brilliant-mistakes-contest/) and underscore the enormous learning potential of mistakes. Innovation remains an active topic of interest, in practice, research and theory for Paul and relates to a new book he is working on, namely how to develop strategies to make your own luck, in business and life. A final area of ongoing research concerns how leaders can manage their enterprises for the long run when their world has become increasingly uncertain. In an ambiguous business climate, successful leadership is less about a detailed plan than about an approach built on strategic capabilities that can be flexibly adapted and reapplied to changing circumstances. His book “Winning the Long Game: How Strategic Leaders Shape the Future,” co-authored with Steven Krupp, builds on twenty years of research and data from over 20,000 leaders around the world. It offers practical advice, profiles well-known leaders, and seeks to bridge the gap between what many see as the separate domains of strategy and leadership. This 2015 book offers user friendly tips and tools to master six disciplines needed for strategic leadership: anticipate, challenge, interpret, decide, align and learn. Paul is continuing research on dynamic leadership, with special attention to collective leadership at an industry rather than just firm level. In this spirit, Paul has profiled leaders operating at societal levels, such Martin Luther King, Nelson Mandela and Pope Francis. Paul was interviewed by Wharton’s Sirius radio program about leadership under uncertainty, as well as profiled in Knowledge@Wharton.